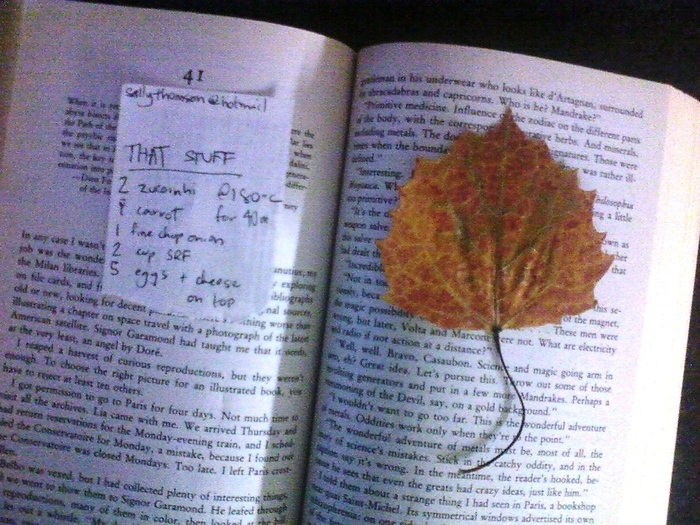 It's always nice to find little things in used books: Appears to be a quiche recipe and a pressed leaf. Done. And unsatisfied. Three ambiguous stars that could as easily fall towards one as they could to five. Perhaps it might have been better to have read this when it first came out, the sensational topics of conspiracies and Knights Templar having been all done to death in the past 20 years. Perhaps I should have waited until I was assured of a week of uninterrupted days at a beach house at the Outer Banks of North Carolina so as to be able to lose myself in the endless dialogue. Perhaps another Eco book will cure me of my inability to say I appreciate the author. Perhaps. Or perhaps the author really is pulling one over on everybody like the unreliable narrator of this novel.